AT THE FOOT OF THE INCLINES up which trains on the São Paulo Railway are hauled by endless ropes. The railway linking the capital of the State of São Paulo with the port of Santos has to overcome an altitude of 2,625 ft in seven miles by a series of inclines. 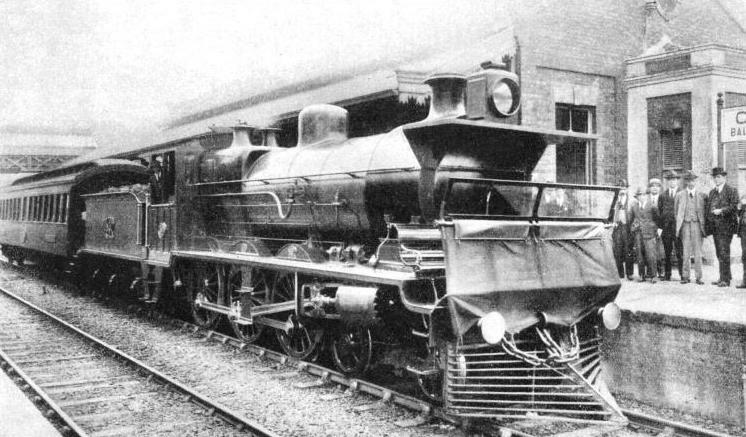 THIS chapter tells the story of the São Paulo Railway, a privately owned British company which operates in the Republic of Brazil, in the State of São Paulo. 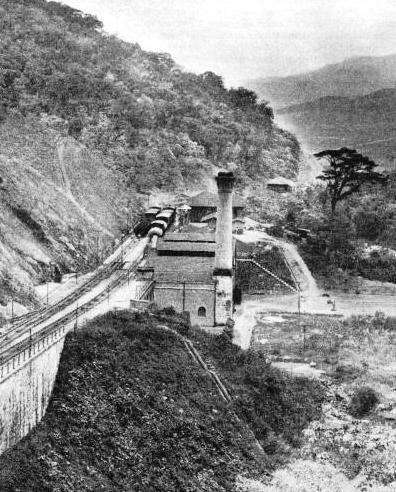 It is the story of a young British engineer who faced and overcame the apparently insoluble problem of building a railway up the side of a precipice to connect the coffee-growing plateau with the state’s principal port. To-day the railway is one of the most important in the State of São Paulo, and it is the only one which links the port of Santos to São Paulo City, the capital of the State. It has to overcome the obstacle of the range of mountains known as the Serra do Mar. In a distance of seven miles the railway rises to a height of 2,625 ft, this altitude being achieved by means of a cable railway. There are many cable railways elsewhere, of course, but this one excels all, owing to the heaviness of its traffic, and to the fact that its unit train loads exceed those of any other cable railway. The Republic of Brazil occupies about one half of the South American continent, and is one of the most extensive countries in the world, the area being nearly 3,300,000 square miles, or over twenty-seven times the size of the British Isles. São Paulo, the maritime state of South Eastern Brazil, is the great coffee-producing state. It has been computed that it produces four-fifths of the world supply, which means that four out of every five cups of coffee we drink come from São Paulo. The problem of getting the coffee grown on the plateau over that edge down to the coast began this railway. Much of the coffee is brought down the mountain wall by steel-wire ropes; for nearly 70 years the coffee has been carried to the world in this way, and the ropes have never once broken, for they have always been watched by experts. This cable railway pulls up passenger coaches over a 5 ft 3-in gauge line on the way from the port to the capital city no life has ever been lost on it. 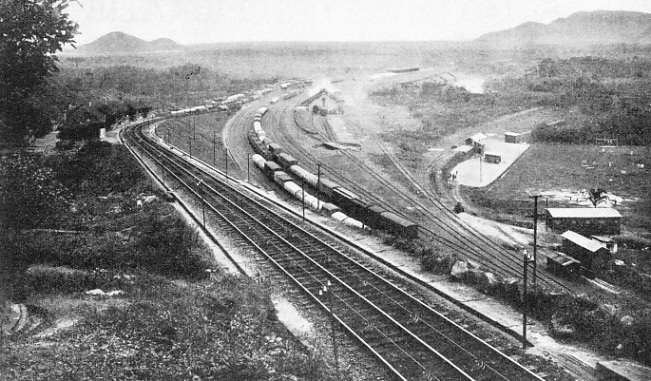 The principal main lines of the state converge upon the São Paulo Railway both at São Paulo and at Jundiahy, with the result that a vast quantity of produce is carried down to Santos over the precipitous line. Fruit, meat, timber and cereals, in addition to coffee, go down over the edge of the Serra do Mar to Santos, while coal, machinery, cotton, motor cars, jute, salt and sugar are pulled up by the “endless” ropes of steel. 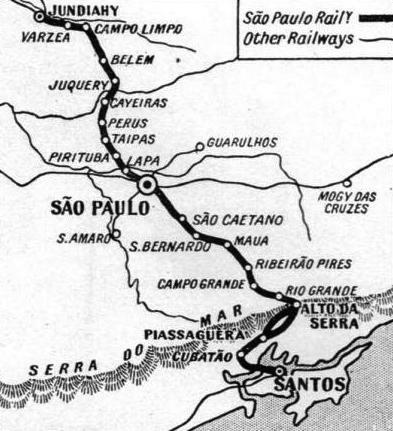 The railway runs from Santos to São Paulo and on to Jundiahy, nearly seventy-two miles. The journey from Santos to São Paulo is made over three distinct sections the first from Santos to Piassaguera, at the foot of the Serra do Mar (19 kilo-metres or about 12 miles); the second, known as the Serra Section (from Piassaguera to Alto da Serra (11½ kilometres or about 7 miles) and the third, from Alto da Serra to São Paulo (48 kilometres or about 30 miles). The Serra section is not only an engineering triumph but also affords vistas of surpassing beauty. The single journey takes less than two hours for the 78½ kilometres or 49 miles; the return journey requires between four and five hours. 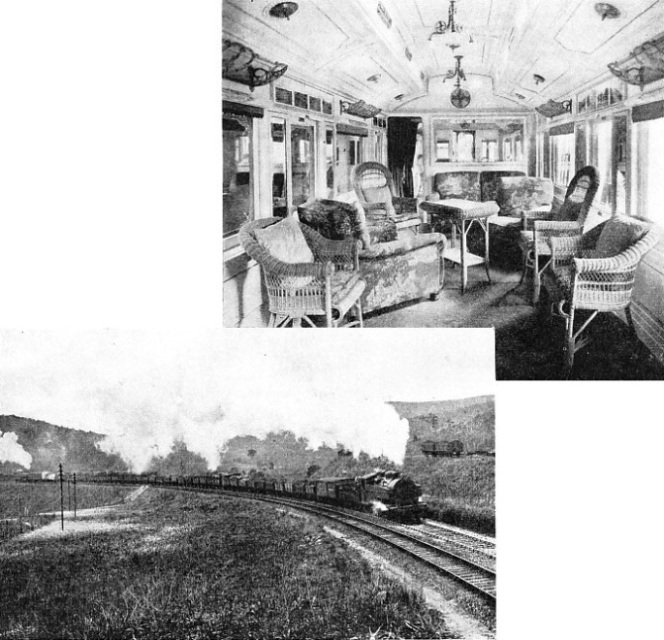 A parlour observation coach us available for tourists, and Pullman cars are attached to several trains. THE RAILWAY ROUTE from the coast Into the heart of the State of São Paulo. From Santos the line follows an almost complete semicircle to the foot of the Serra, its course being influenced by the many rivers which flow from the mountains across the low-lying coastal plains to the sea. On either side of the line are banana plantations. The State motor highway runs alongside the railway as far as Cubatão, the first station, and then branches away to the left for the ascent of the Serra. This road and its innumerable windings up the Serra can be seen from the train. The pipe-line of the light and power company from the big reservoir on the plateau down to the hydroelectric plant, hidden away among the foot-hills near Cubatão, is also visible. We then reach the second and spectacular section of the line which makes it world famous. At Piassaguera the steam locomotive is uncoupled, and the train is divided into sections of three coaches and hauled up to the top of the Serra. At the summit a steam locomotive is waiting to pull the train to São Paulo and Jundiahy. The locomotives from Santos cannot climb the precipice, and the locomotives from São Paulo cannot descend it; but the cable-way provides the link. Before describing the ascent, it is opportune to tell the wonderful story of its conquest by a young man of courage and ideas, who succeeded where all before him had failed. As far back as the 1830’s Brazilians had been considering the establishment of a railway to afford an outlet for the coffee crop. In 1839 a scheme was prepared and referred to Mr. Robert Stephenson for his opinion and advice; but nothing came of it, for the time was not ripe for such an enterprise as the conquest of the Serra do Mar. But the need was so great that enterprising Brazilians determined that the problem should be solved. The position was tantalising. On the great inland plateau were the commercial centre and the coffee plantations. It was easy to bring produce to the edge of the Serra within sight of the sea and the port, but there was no way of getting it over the edge. In 1856 a number of Brazilians, among whom was the Baron de Maua. received a concession from the Government for the construction of the railway from Santos to Jundiahy. LOOKING OUT TO SEA on the first of the five inclines. The ropes can be seen between the rails. The average weight of the train that the ropes can haul is 120 tons. Of this weight six loaded wagons account for 89 tons and a locomotive brake van for 31 tons. The small wheels which, on close examination, can be seen between the rails serve as a guide and support for the ropes. Baron de Maua, the leading spirit, was resolved that the line should be built. He even took upon himself to have preliminary surveys made from Jundiahy towards the coast. But his engineers only ran their lines roughly to the eastern edge of the plateau. There they stopped, not from lack of funds, but because they were baffled. The plateau tumbled precipitously almost into the sea, only a narrow coastal strip lying between it and the Atlantic. Baron de Maua sent to England to enlist the aid of the eminent British railway engineer James Brunlees. But the Brazilian concessionaires had no intention of permitting the engineer to solve the difficulty as he pleased. Nothing but a locomotive line would be accepted; there were two points which were to be connected with the shortest possible link of steel; and there was £2,000,000 available for the work. It had to be completed for this figure otherwise the Brazilian concessionaires would go elsewhere. Moreover, for this sum a first-class line, equal to the best in every respect, was insisted upon a pioneer type of railway would not pass muster. 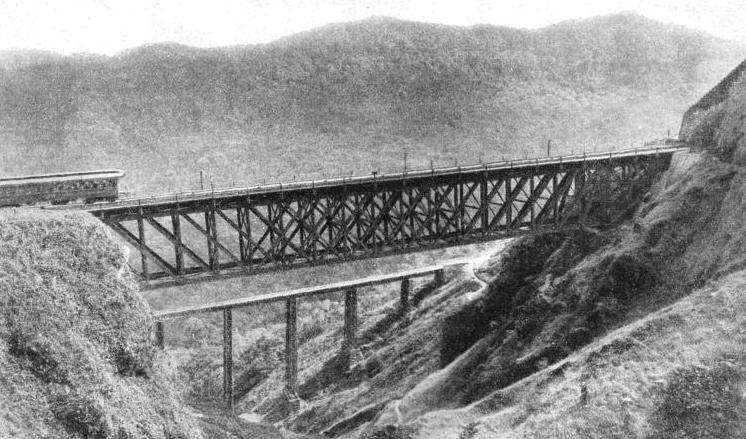 James Brunlees, although aware of the formidable difficulty presented to construction by the granite cliff of the Serra do Mar, accepted the challenge on the Brazilian concessionaires’ terms. Brunlees’ first step was riot only to consider the problem of the Serra, but also to look for a man capable of tackling that cliff which had hitherto defied all attempts to conquer it. The circumstances demanded an engineer who had a railway eye for the country, was accustomed to working in mountainous districts, and was thus qualified by experience to grapple with the peculiar difficulties which were certain to crop up. The eminent engineer remembered one of his former pupils, Daniel Makinson Fox, who had been connected with some most difficult undertakings. Daniel Fox was then only twenty-six years of age, but he had demonstrated his ability in no uncertain manner, having assisted, among other enterprises, in laying out and constructing a narrow-gauge railway in North Wales. There was another recommendation in the young man’s favour. He was conversant with Spanish, having mastered this language while spying out the land for railways among the mountains of the Pyrenees, and, although Portuguese is the language of Brazil, the similarity between the two is such that a man with a knowledge of one can soon learn to speak the other. Accordingly the young engineer was summoned to London, where the conditions of the undertaking were explained to him. He was instructed to proceed to São Paulo to make surveys for a locomotive line, the cost of which was not to exceed the £2,000,000. In after years Fox vividly recalled the beginning of his great adventure. His knowledge of Brazil was somewhat hazy, but he did not worry his head about his pending work during the sea voyage, as he felt sure that all his anticipations would be shattered by reality. It was, perhaps just as well. Had he visualised in advance the details of his task he would have been reduced to working out problems on insufficient data. As it was, when he reached Santos and came face to face with the Serra do Mar he gave way to as severe a fit of despondency as can be imagined. That tall rampart appeared to be as impossible of conquest by a locomotive as the Himalayas, and Fox conjured up visions of the entire £2,000,000 which had been set down or the whole distance to Jundiahy going in the climb up that escarpment. Nor did his spirits rise when he pursued the first task of an engineer who is dropped into a strange country. He asked questions in Santos about the trails, paths, and water-courses cutting through the Serra, but the information thus obtained was of a very meagre description. The abortive result of these preliminary investigations proved only too conclusively to the young man that he would have to find out everything for himself. There being no maps to guide him, he had to become an explorer as well as an engineer. He got together a small party of trusted natives to act as carriers and to perform other varied tasks. Equipped with a good supply of axes and other tools, he plunged into the dense forest which clothes the cliff from base to crest. The going was hard and slow, The virgin forest was dense and tangled - so much so that the sun never penetrated the foliage to strike the ground. The rainfall was terrific. In addition Fox and his men were constantly checked by the precipitous ravines which score the Serra in all directions. Their passage had to be forced at the imminent risk of a fall and broken limbs. There was a heavy demand upon axe-work, and advance under such conditions was show. A PASSING POINT ON AN INCLINE. The permanent way on the upper part of the inclines has three rails, except at the crossings, where two separate lines are used. Below the crossings there is only a single line. The rails are of the “Vignoles” type and weigh 93 lb per yard. The exceedingly arduous conditions which prevailed demanded special arrangements. It was impossible to drive straight ahead through the forest from point to point, remaining in this timber prison until the opposite side was reached, owing to the difficulties pertaining to the commissariat and the serious risk to health involved. The young engineer therefore resorted to what might be described as periodical dives into the bush. He would load up his pack-train with a large stock of provisions of a strictly limited variety - the full extent of the art of canning food had yet to be revealed - making doubly sure that a good supply of tobacco was in the packs, and then he would strike his route. On reaching a suitable point in the bush a clearing was made, and a few huts of palmetto leaves run up to provide shelter from the rains and a tolerable resting place. From this camp narrow headings, virtually Indian trails, were driven in various directions, and the levels and distances were roughly taken. As a rule, three weeks was the duration of each trip into the jungle. The young man emerged considerably whiter than when he went in, as his skin became bleached from lack of sunlight. After one of these ventures camp would be broken and the engineer would return to Santos or some other convenient point, where he would stay for a fortnight, devoting his time to unravelling the copious notes collected during the groping into the virgin forest. On one occasion young Fox was immersed longer than he had anticipated, and when he at last emerged he was so pallid, thin, and drawn that his companions in Santos at once jumped to the conclusion that he had been stricken down with fever. 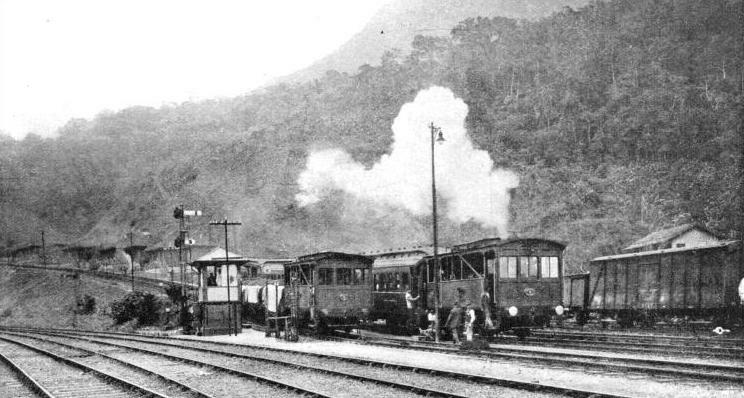 In this manner the engineer tramped up and down the Serra do Mar for month after month, but the discovery of a pass through the rampart up which trains could be drawn appeared to he as far off as it was on the day he landed at Santos. One morning, however, he descried through the trees a big fissure in the ridge, and at last thought he had succeeded. The party struggled to the big, rugged V, amid then their hopes vanished. They saw a waterfall and a sheer cliff on the inner side, a beautiful piece of scenery but nothing more. SPLICING THE WIRE ROPE by means of which trains ascend and descend the inclines. The rope, 5¼-in in circumference, is composed of six strands of steel wire on a hemp core, and, when new, is tested to a breaking-point of 108 tons. Even in his disappointment the eye of the young engineer appreciated the rugged majesty of the scene, and the exploring spirit that was part of his personality was so aroused that for the time being he ceased to worry about the railway, and determined to examine the fall at close quarters. With infinite labour he scaled one of the side walls of the fissure and then took a breather to enjoy the view unfolded from the top of the waterfall. The view was lovely. Fox lit his pipe and smoked, enjoying the respite. His eye, idly taking in the details of the scene, saw that the valley floor, watered by the Rio Mugy, rose gradually to the north-east. He had explored that valley before, but from the bottom of the depression he had been unable to see what was now revealed. In a flash he espied the only feasible route for the line to the top of the plateau. Descending to his companions, the engineer led them back to the valley. Then he carefully drove a way along the route which he had observed from the edge of the waterfall. As he expected, it brought him to the top of the Serra, whence a gap cleaving through the mountain in a north-westerly direction brought him on to the plateau. Following this up, he gained the point on the highlands to which the Brazilian surveyors had brought their lines some years previously. When young Fox had committed to paper the results of his investigations, and had evolved his location, he found that he could negotiate the Serra within a distance of five miles. This in itself was an achievement, inasmuch as previous computations had indicated the necessity for a tortuous line of about twenty-six miles to overcome the cliff. But in this short length of five miles a difference in level of over 2,500 ft had to be overcome. Such a sharp rise made a continuous adhesion track impossible, unless zigzagging, V-switches, and other intricate devices were incorporated. But this was out of the question on account of the cost, bearing in mind the £2,000,000 limit for the whole of the railway. Since those were the days before rack-and-pinion propulsion, Fox was at a dead end. But he was convinced that there was no easier path through the Serra, and he decided to stick to his location. Desperate situations demand drastic remedies. So, foiled in his efforts to achieve a gradient not exceeding 1 in 40, the young man, determined to get his trains up, decided to pull them up by a cable. He divided the ascent into four sections. In this way the trains would ascend and descend the mountain-side in steps. Each section, or incline, was topped by a short length of line known as a bankhead, 250 ft in length, and descending at a gradient of 1 in 75. At each of these points stationary winding engines were to he placed. In this manner four inclines, 5,842, 6,388, 6,876, and 7,017 ft in length respectively, were provided, each having a gradient of 1 in 9·75. Young Fox spent fifteen months preparing these plans, and then he set sail for England with his proposals. They were scrutinised minutely by the master-mind of Brunlees. As the cost of building a railway on the young mans plans would not exceed the limit of £2,000,000 Brunlees gave the ingenious solution of the problem his wholehearted support. A POWER STATION at a bankhead on the inclines. The inclines are operated simultaneously and the movement of trains is controlled from cabins at each bankhead. The cabins are connected by telephone with one another and with the engineer in the power station. The project received the approval of the company which had been formed to build the line, and construction was begun. Fox, when he presented his surveys, did not fail to point out the fact that heavy excavation and development work would be unavoidable in scaling the Serra, and his cautious statements proved to be in no way exaggerated. When the railway builders appeared upon the scene they found themselves faced by conditions which had seldom been previously equalled in such operations. Although the first dozen or so miles out of Santos run through practically level country for a greater part of the way, the land is marshy, and before it reaches the foot of the cliff the line has to cross an arm of the sea and two formidable rivers, both of which are subject to heavy and sudden fluctuations in level. For the first eight miles a low embankment had to be raised to receive the metals laid on the 5 ft 3-in gauge, the course of the line paralleling the Government road laid across the marshes. A 500-ft bridge takes the railway across the arm of the sea which separates from the mainland the island on which stands time port of Santos. The Cubatão River is crossed by four 75-ft spans, and the Rio Mugy by three 66-ft spans. But it was the incline section which puzzled the builders. In the first place, in order to haul their supplies and material to their scattered camps, they had to drive roads through extremely rough country and dense forest. As the region was uninhabited and for the most part unexplored, reliance had to be placed upon the rough maps which Fox had drawn when preparing his surveys. The railway in its climb to the plateau ascends the spur forming the east bank of the Rio Mugy. The sides of the mountains are torn by gullies, chasms, couloirs, and rifts in the most fantastic manner. As these run at right angles to the railway their negotiation presented many problems, as did also the overcoming of the spurs and shoulders of treacherous rock forming the walls of the gaps. Owing to the composition of the mountain, which consists of granite and rubble, blasting in the face of the precipice was impossible and the outside rock had to be cut away by hand. Some of the cuttings are of great magnitude, running to depths of nearly one hundred feet. The trials of the builders were aggravated by the many land slips and rock-slides, precipitated by the heavy rainfall. Time after time an embankment completed ready for the rails was demolished. As a rule, the earth could be prevented from slipping only by throwing up at vital points massive retaining walls varying from ten to sixty feet in height. After the line had been opened, one heavy land ship completely blocked a cutting, but it was removed in an ingenious manner. A mountain torrent was diverted so that it rushed into the cutting. Gangs of men were crowded on to the work, moving the soil then the water, assisted by the heavy fall of 1 in 9·75 represented by the gradient, scoured away the loose detritus effectively, economically, and expeditiously, leaving behind the heavier stone, which was utilised for building purposes. At the foot of the fourth incline a deep chasm had to be crossed by means of a viaduct 705 ft in length, divided into one 45-ft and ten 66-ft spans, with the rails, in the centre of the viaduct, 185 ft above the floor of the valley. Owing to the difficult character of the situation, the simplest means of erection had to be employed. A wire rope was stretched across the rift, along which man a block and tackle whereby the vertical members of the pier were placed. The spans were set by means of a crane, one by one, beginning from the south side, to which material was brought. The remainder of the line from the top of the inclines to Jundiahy, sixty-eight miles away, runs through undulating country. Even this section required extensive work. The first twelve miles from the Serra summit are severe, with frequent embank-ments and cuttings, gradients as steep as 1 in 50, and curves of 1,320 ft radius. On the inclines themselves the curves vary in radius from 1,980 to 5,280 ft. The hardest section of the plateau division is the thirty-eight miles from São Paulo to the inland terminus at Jundiahy, owing to the country being more broken. From a point seven miles out of São Paulo the line cuts at right angles across a succession of rifts and ridges, entailing heavy cuttings, embankments, and bridging. Sharp gradients were unavoidable, the stiffest being 1 in 40. In order to overcome the Belem summit, a tunnel 1,950 ft in length had to be driven. On the north side of the tunnel a serious landslide menaced the safety of the line for a considerable time. It was not until the treacherous earth was removed from beneath the metals and replaced by a solid invert of stone twelve feet deep, made up in lengths of eight feet, that stability was secured. The inclines are laid out upon an ingenious principle. As they are worked upon the counter-balancing system, whereby one load descends while another ascends, a crossing has to be provided at a halfway point. On the lower part of each lift an ordinary single track is laid, branching out at the passing point into two tracks, which are of sufficient length to accomm-odate the longest trains. But above the crossing there are three metals, the centre rail being common to both up and down traffic. This arrangement permits of two lines of cable pulleys - one on each side of the centre rail - one for each load, while below the crossing only a single line of pulleys is necessary. 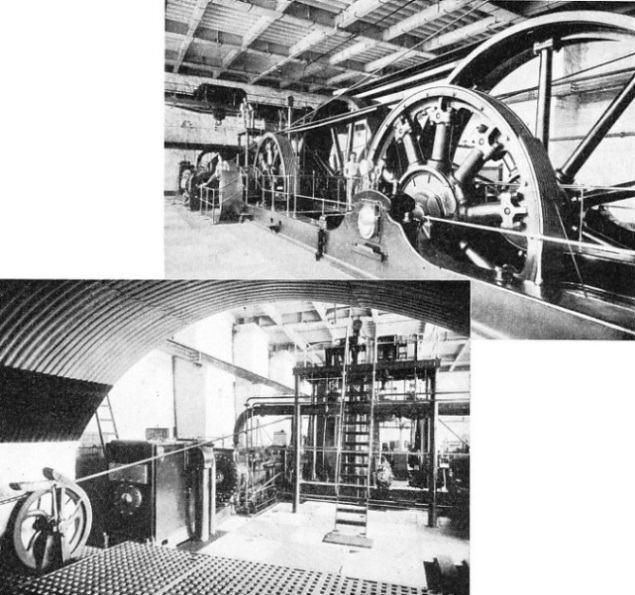 At each bankhead a pair of non-condensing horizontal engines of 150 nominal horse-power were installed to drive the winding machinery. The rope pulleys, 10-ft in diameter, were driven through friction gearing. A special brake wagon operating a clip brake was attached to every train running in either direction. Each train averaged about four vehicles. The time occupied in negotiating each incline was about fifteen minutes, or one hour for the ascent of 2.550 ft from the foot to the summit of the Serra. Four trips per hour could thus be made, although, if necessary, the journey could be accelerated by about fifteen minutes. VIADUCTS AND TUNNELS form together about one-fourth part of the length of the Serra do Mar Inclines. Nearly four thousand tons of steel work were used in the construction of sixteen viaducts, two of which are seen here. The original incline is seen in front of the new one. Fox succeeded in keeping within the estimates. 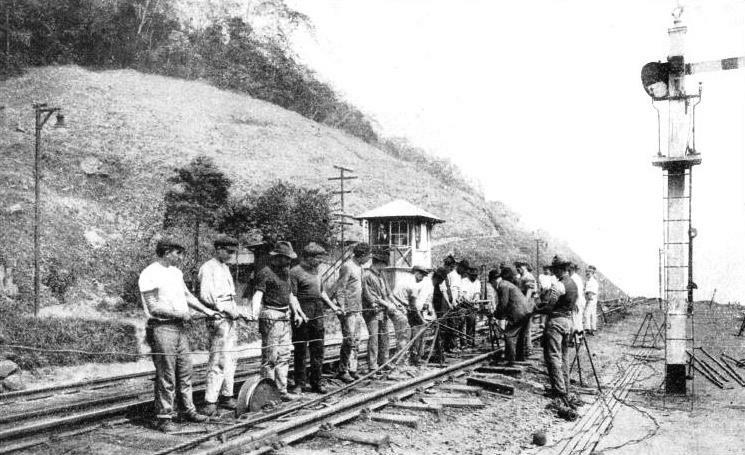 The contractors built the railway ten months ahead of the specified time (eight years) and were awarded a bonus of £43,750 by the Brazilian Government. 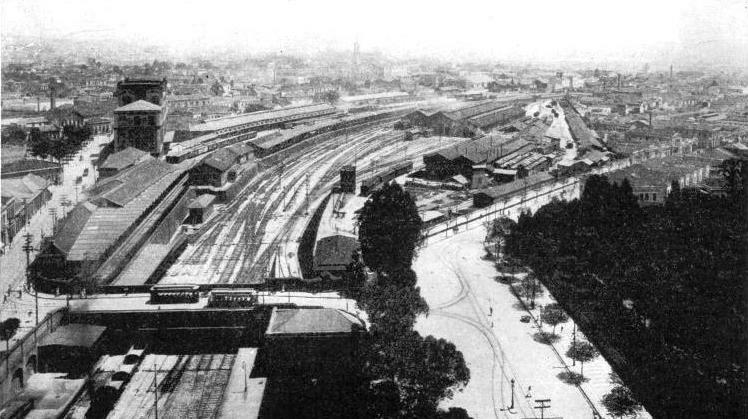 The line was opened to traffic in the year 1867. This section of the inclines is, of course, the old one, and it is still used. But the coffee traffic gradually outgrew its capacity, and a new track was laid, roughly parallel to the first, and constructed upon the same cable system. 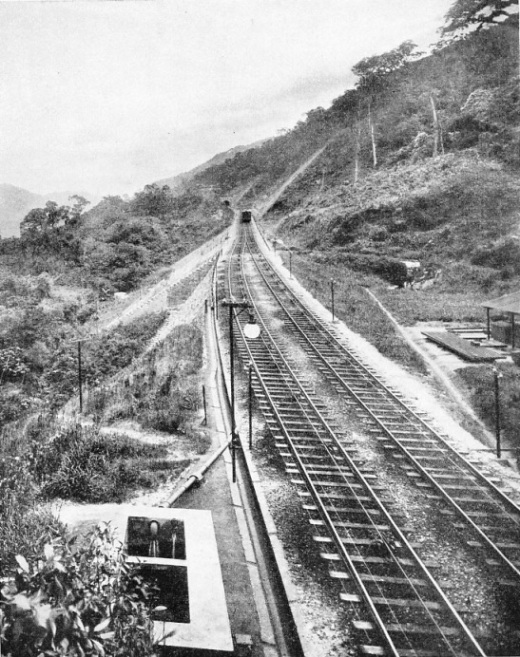 The new line, which was opened in 1901, is laid somewhat higher up the mountain side, the shoulders and spurs being tunnelled, while the rifts are spanned by heavy steel bridges. The new cable-way up the Serra, which is in five sections instead of four, has considerably shortened the duration of the climb. When the locomotive is uncoupled at Piassaguera the train is divided into sections of three coaches, each section going up at intervals of nine minutes. The system of rope haulage on the old line is known as the “Tail-End” system, while that on the new is called the “Endless Rope” system. These cables are wonderful pieces of workmanship. They are made in England, and are an expensive item in the upkeep of the railway. Each costs £2,000 when new, and lasts from about eighteen months to two years, according to the varying amounts of work it has to do. The rope is composed of six strands of steel wire on a hemp core, and has a circumference of five and a quarter inches. The breaking strain, of 108 tons when the rope is new and 72 tons when it has been worn, gives a wide margin of safety, as the maximum working load on the rope from all sources is eighteen tons. Every day the rope is examined by experts with the care that befits such an expensive patient. The safety precautions prevent anything terrible from happening if a cable should break; but the cable does not break. For the duplication of the entire line, which was begun in 1895, a new route was chosen. This fact must be borne in mind when comparing the heights and other data of the new with the old. The journey from Santos to Piassaguera takes only about 20 minutes. The average weight of train which can be hauled on the inclines is 120 tons, comprising six loaded wagons, weighing eighty-nine tons, and the locomotive brake which weighs thirty-one tons forty-six tons of this is paying load. The time necessary to run a trip is nine minutes for each of the five stages; of this, seven and a half minutes is running time and the other minute and a half is for the change over of ropes on each bankhead. The vertical rise from bankhead to bankhead is 525 ft. About 5,000 tons of merchandise are hauled up every day; on the average. The five inclines, each with its separate hauling plant, work simultaneously, so that when the inclines are working there are always five trains ascending and five descending, the vehicles on one side of a rope being balanced by those on the other. The goods or passengers may or may not be equal in weight in both trains, but statistics show that the average unbalanced load is insignificant and on the down side. The power house contains four boilers to supply steam to the hauling engines. Two or three of the boilers are in steam according to the demands of the traffic. They are of the Lancashire type. 7 ft 6-in in diameter and 27 ft long, and are fitted with a patent mechanical stoker for supplying the furnaces with coal, and also with a patent economiser for heating the feed water before it is fed into the boilers. Steam at 100 lb pressure is supplied to the hauling engines through a ten-inch diameter steel pipe which passes from the boilers to the engine houses. The hauling engines, each of approximately 1,000 horse-power, are of the two-cylinder condensing type; the cylinders, having a diameter of 32-in and a stroke of 5 ft, are fitted with valves operated by link motion and a special trip gear. There are two motion shafts on which are mounted the rope drums for driving the wire rope, and also the large flywheels, 25 ft in diameter. These serve to connect the two shafts by means of sixteen cotton ropes, so that the second motion shaft shall be driven by the engine equally with the crankshaft. The wire rope enters the engine-house from the up line, makes four turns round the rope wheels, passes to a 14 ft diameter fixed return wheel at the back of the power-house, and then passes out to the down line. Five complete and similar systems, it should he remembered, work the five separate inclines. The rope wheels, 14 ft in diameter, which drive the wire rope, are of a design known as a differential rope drum. The rope grooves are each formed on a loose ring slipped over the turned rim of the wheel, the number of rings being in accordance with the number of turns or wraps which the rope is given on the wheels to obtain the necessary friction for the drive. This design avoids the extraordinary strains in the wire rope which would be caused by inequality in the diameter of the rope grooves due to unequal wear. The simultaneous working of the inclines is controlled from cabins stationed on each bankhead and connected by telegraph, telephone, and electric signals both with one another and with the driver's platform on time hauling engine. There is also an electric signal wire on either side of the line throughout the length of the inclines, to enable the brakeman to signal directly to the driver of the hauling engine, and stop his train, if necessary, at any point on any one of the inclines. The locomotive brake used on the new inclines is a very remarkable machine. Its chief function is to secure the train on to the rope and to act as a brake; it has sufficient tractive power to push the train along the bankheads or level stretches at the foot of the inclines, so as to reach the points where the locomotive brake mechanism is used for lifting the rope and securing it to the rope-grip placed underneath. The gradient of the new track is 1 in 12½; each of the five sections is about a mile and a half in length. By lengthening the climb the constructors have made it considerably less steep than the 1 in 9·75 gradient of the old line. On the new inclines there are thirteen tunnels totalling 1,476 yards in length, and sixteen viaducts totalling 1,508 yards. THE CITY OF SÃO PAULO, linked by rail with the port of Santos on the coast, is the capital on a coffee-producing State. Coffee constitutes a large portion of the freight traffic on the São Paulo Railway and consequently on the famous Serra do Mar cable way. A SPECIAL SALOON (above) built for ultra-comfort on the São Paulo Railway. Observation cars of this type are attached to some of the express trains. ON THE MAIN LINE of the São Paulo Railway (below), between the city of São Paulo and Jundiahy. Although the inclines have been left behind, gradients are still severe the picture shows a freight train, assisted in rear, ascending a bank near the Belem Tunnel on the summit of a ridge. THE HAULING ENGINES used on the new Serra Inclines are each of approximately 1,000 hp. The cylinders have a diameter of 32-in and a stroke of 5 ft. There are two motion shafts, on which are mounted drums for driving the wire rope, and also the large flywheels of 25 ft diameter. THE ENGINE-HOUSE INTERIOR. The wire rope enters this engine-house from the up line and makes four turns round the rope wheels. It then passes to a 14 ft fixed return wheel and thence out to the down line.